The goal we had in mind when we created these muffins was to get them as chocolaty as humanly possible. We’ve achieved success! We’re using 3 forms of chocolate in these muffins and still managed to keep them relatively keto friendly. 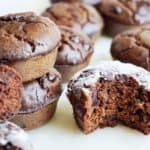 Low carb chocolate muffins are the perfect breakfast for those days you want to treat yourself a little bit. We’ve made a video to show you how to make them step by step! We’ve been experimenting with a number of low carb flours lately and there was only 1 that was truly up to the job of harnessing all of this chocolate. Peanut flour! Peanut flour is a new item in our pantry and we are loving all of the possibilities it offers. I like to describe it as a middle ground between almond flour and coconut flour as far as liquid absorption goes. Almond flour is not absorbent at all, while coconut flour is hyper-absorbent. Discovering peanut flour has really opened up some new options for us since it adsorbs a good amount of liquid but doesn’t get as dry and crumbly as coconut flour often does. Lily’s chocolate is another staple in our kitchen, however it can be quite pricey. A 9oz bag will generally run you $6-$8. These chocolate chips are what takes these muffins to the next level though. They are sweetened with stevia and add the slight sweetness you’re looking for in a good chocolate muffin. If you can’t find Lilly’s you can add in some stevia or some extra erythritol to up the sweetness and you’re all set. If you’re a chocolate fiend like us, try some of our other awesome chocolate keto recipes! We’ve got an awesome chocolate fudge cookie recipe as well as a delicious low carb chocolate cheesecake! Recipe video located at top of post.